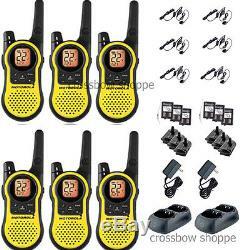 Brand New Sealed (6 Pack Set) Motorola Talkabout MH230TPR. The Motorola Talkabout® MH230TPR value pack comes equipped with three FRS/GMRS radios, three earbuds with Push-to-Talk microphone, one dual desktop charger, three belt clips, one wall adaptor and three NiMH rechargeable batteries. These radios are a must-have communication tool for each and every outdoor enthusiast. This radio is perfect for family and friends to stay in touch whether tackling a back country trail or braving a crowded shopping mall. The lightweight MH230TPR has exceptional range and comes packed full of essential features. With a range of up to 23 miles and freedom to communicate wirelessly, the MH230TPR won't slow you down. The range in real-life conditions can be reduced from maximum range. How far can I expect my radios to communicate? The communication range quoted is calculated based on an unobstructed line of sight test under optimum conditions. Actual range will vary depending on terrain and conditions, and is often less than the maximum possible. Your actual range will be limited by several factors including, but not limited to: terrain, weather conditions, electromagnetic interference, and obstructions. Total Emergency Preparedness The MH230TPR includes an emergency alert feature, allowing you to enjoy your escape to the great outdoors with confidence that others can be informed of any dangers that may come your way. When the alert button is activated, the radio transmits an alert siren followed by transmission of spoken or incidental sounds. This allows you to send the signal to other radios and warn of impending danger. The MH230TPR also features a built-in LED flashlight for peace-of-mind during evening adventures or unexpected emergencies and power outages. NOAA Weather Channel Want to know where the best conditions are for your rocky climbing outing? Tune into one of seven NOAA channels (National Oceanic and Atmospheric Administration) on your MH230TPR for continuous local and regional weather broadcasting. And when you are out having fun, weather alerts will provide you with warnings of incoming weather to protect you from the danger of a sudden storm. Full-featured Privacy The Talkabout® MH230TPR has full 22-frequency capacity with 121 privacy codes to reduce interruptions. The Motorola QT (Quiet Talk) functionality allows the radios to be set so they can communicate with other compatible Motorola products, adding yet another level of distinction from other manufacturers. No need with the MH230TPR. The iVOX feature allows them to speak hands-free. Acting like a speakerphone, the iVOX lets you chat without stopping what you are doing to ensure that there is never an excuse not to keep in touch. Top Mid Base Ranges (miles). QT (Quiet Talk) Interruption Filter. H x 2.14 in. W x 1.15 in. VOX iVOX Hands-free Communication With or Without Accessories. 14 Hours Alkaline (3 AAA) or 12 Hours NiMH. All questions/comments are routed to a mobile device, so you WILL receive a very quick response! 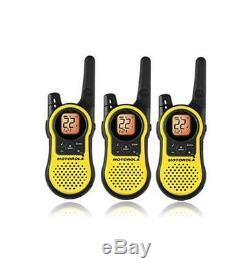 The item "Motorola Talkabout MH230TPR Walkie Talkie Pack Set 23 Mile Range Two Way Radio" is in sale since Saturday, February 20, 2016.